Dr. Enrico Ferdico personally dropped 50 pounds in 60 days on this program more than four years ago and he has kept the weight off. Dr Ferdico is so confident of this program that the results are guaranteed due to his revolutionary breakthrough technology. Not only will you lose weight – permanently – but you’ll be healthier too. This is not a diet or weight loss program - this is a health transformation.You are going to love the new you! New patients have a consultation and evaluation (done by Dr. Ferdico personally). Then the patient undergoes a Body Composition Analysis (BCA) to get accurately evaluated. CERF (Comprehensive Electro- Impedance Resonant Frequency) Technology generates a hormonal "fingerprint", creating a baseline. There are usually 5 or more likely out-of-range bodily organs which can impact weight loss and keep the body in fat storage rather than fat burning mode. Dr Ferdico focuses on the physiological scan and biomarkers (this shows which organs are weak and malfunctioning) indicated by the technology. With the test results of the technology he custom tailors every patient’s weight loss approach to the patient and patient's test results. Meals on the program are real foods: many fruits, healthy proteins, and vegetables. There are zero prepackaged meals, no shakes and the program is completely drug-free. The meals are reduced calorie and nutritious. The meal plan is easy to follow. There are custom formulations and supplements to support organ function and assist in re-balancing hormones to put the body into fat burning mode (autophagy) for optimum weight loss. 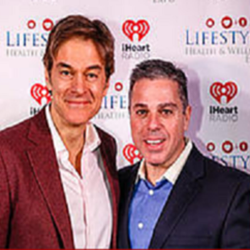 Dr. Enrico Ferdico personally lost over 50 pounds of fat in 60 days on this exact program more than four years ago and he continues to be healthy, fit and happy! Dr Ferdico is so confident of the technology and the program that the results are guaranteed! Average female patient loses 25 - 35 pounds in 40 days. Average male loses 35 - 45 lbs in 40 days. Dr Ferdico personally guarantees that you'll love the way you look and feel. A happier, healthier and new YOU!